PLAMONDON, ANTOINE, painter, teacher, farmer, and politician; b. 29 Feb. 1804 in L’Ancienne-Lorette, Lower Canada, son of Pierre Plamondon and Marie Hamel; d. unmarried 4 Sept. 1895 in Pointe-aux-Trembles (Neuville), Que. The son of a farmer, Antoine Plamondon is believed to have enjoyed the protection of his parish priest, Charles-Joseph Brassard* Deschenaux, who reputedly enabled him to complete his primary education and then encouraged him to become a painter. At the time Plamondon signed his contract of apprenticeship to painter Joseph Légaré*, on 1 March 1819, he was living at Quebec, where his father had recently established himself as an innkeeper in Saint-Roch ward; the apprenticeship was to last until he reached his majority. Légaré had been trained as a painter and varnisher and was then a young artist with little experience. During his six years of apprenticeship Plamondon learned on the job to paint and draw, helping to make copies of religious paintings as well as to restore works from the Desjardins collection [see Philippe-Jean-Louis Desjardins*], and even carrying out certain tasks connected with Légaré’s earlier occupation as a varnisher. In March 1825 he left Légaré and set up on his own in a studio on Rue Sainte-Hélène (Rue McMahon). A year later, having doubtless become aware that his training was limited, he expressed the intention of going to Europe for further study. The Desjardins collection had given him an inkling of the wealth of artistic treasures to be found there. Plamondon left Quebec in July 1826, probably with his cousin Ignace Plamondon. They had letters of recommendation from Abbé Louis-Joseph Desjardins*, dit Desplantes, to his brother Abbé Philippe-Jean-Louis Desjardins, the vicar general of Paris, under whose protection they remained while studying in the studio of Jean-Baptiste Guérin, known as Paulin-Guérin, the official painter of Charles X. Not being very resourceful, the two young men were a burden to Desjardins, who described them as “babes in arms.” Antoine is believed to have taken the opportunity to visit Rome, Florence, and Venice. Terrorized by the July revolution in 1830, he hastened to return to Quebec in the autumn, his monarchist convictions more firmly entrenched than ever. Plamondon informed his clientele of his return by publishing an advertisement in French and English in the Quebec Gazette on 8 Nov. 1830. With great confidence in his natural talent coupled with an excellent European training, he soon took advantage of the prestige attached to being the pupil of “the painter to the king of France,” and turned out numerous copies of religious paintings as well as portraits. In 1832 he ambitiously undertook to make a large-scale copy of Raphael’s Transfiguration an “enormous task,” which meant he had to restrict access to his studio on Rue Sainte-Famille. Convinced of his own importance, he soon considered the city his private preserve. As early as 1833 he gave full vent to his jealousy and intolerance by ridiculing in the press the diorama that had just been painted by James Bowman*, a rival of American origin. That year he set himself up as a great connoisseur, reprimanding the Montreal and Quebec newspaper columnists who had had the misfortune to extol the merits of a group of paintings by masters of the Italian and Flemish schools. Plamondon’s arrogance was greeted with scathing rebuffs, but they did not lessen the admiration his work already commanded. 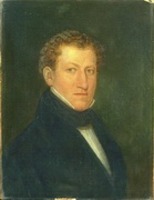 The Reverend Daniel Wilkie* in an address before the Literary and Historical Society of Quebec in December 1833 pointed out that he was a skilled copyist and a masterly portrait painter, terming some of his portraits of military men absolute masterpieces, and he suggested that the government should provide him with a proper place to work. 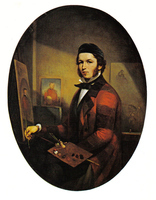 In April 1834 Plamondon announced with obvious pleasure that as of the following month he would have “an apartment in the magnificent provincial parliament building in which to do his paintings.” However, his satisfaction was short-lived when he found out that the British portrait painter Henry Daniel Thielcke would be given similar privileges and would, moreover, occupy a studio next to his own. During the following year Thielcke made several studies for religious compositions and exhibited in his studio a painting of the baptism of Christ that was given a favourable review in Le Canadien and the Quebec Mercury. This was too much for Plamondon. Writing under the pseudonym Des Amateurs, he immediately mounted an attack on his rival’s work, condemning both Thielcke’s drawing and his use of colour. His scornful comments had a disastrous effect on Thielcke’s career in Quebec, forcing him to abandon religious painting. Plamondon was already the most sought-after artist in Lower Canada, with commissions coming in from all sides. In 1835 he painted the portrait of Bishop Pierre-Flavien Turgeon*, the coadjutor to Archbishop Joseph Signay* of Quebec. The following year Signay in turn commissioned work from Plamondon, who magnanimously agreed to spend the summer away from Quebec in order to comply with “the repeated requests of several of Montreal’s leading citizens.” Delighted at his arrival in Montreal, La Minerve once again hailed him as “the most talented painter in the country.” During his stay in Montreal, the artist was in such demand that he was unable to accept all the commissions offered. In addition to securing from Sulpician Joseph-Vincent Quiblier* the important contract for painting the Stations of the Cross for the church of Notre-Dame, he did numerous “family portraits,” including those of John Redpath* and his second wife Jane Drummond, one of Louis-Joseph Papineau*, who was then at the peak of his political career, and a matching portrait of his wife Julie and his daughter Ezilda. Papineau also commissioned him to make a copy of Young woman at her toilette by Titian, a work which the artist doubtless placed in the category of “genre-paintings and works of fantasy” along with Lost in the wood which he painted that year for a Quebec lawyer. From the autumn of 1836 to that of 1839 Plamondon devoted most of his energy to painting the 14 large canvases of the Stations of the Cross. To complete such an ambitious undertaking he probably had the help of two apprentices he had hired in 1834, François Matte and Théophile Hamel*. In 1838 he none the less found time to paint a still life with grapes, La vigne, as well as a remarkable portrait of Zacharie Vincent*, Le dernier des Hurons, which had a great impact. That year Plamondon was authorized by Abbé Jérôme Demers* to move into a more spacious studio in the Hôtel-Dieu de Québec on Rue du Palais. There the editor of Le Fantasque, Napoléon Aubin*, came to pay him a visit. Enthused by what he saw, Aubin wrote a long review, emphasizing the excellence of the artist’s portraits and copies of religious paintings. Plamondon completed his Stations of the Cross in the autumn of 1839 and exhibited them at the parliament building from 27 November. There was a favourable response from public and critics alike and the exhibition had to be held over for another week until 17 December. Despite this success and the artistic merits of the paintings, the sponsor had to reject them, for eight of the subjects chosen by the artist did not correspond to any of the conventional Stations of the Cross recognized by the church. Late in December 1840 Plamondon began looking for an apprentice, since Matte and Hamel had left at the end of their training period. 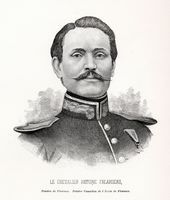 Vital Durocher was chosen to replace them. Plamondon had been giving drawing classes at the Petit Séminaire de Québec for some ten years, with the support of Abbé Demers. He was periodically congratulated on his teaching, which was to continue until 1845. He also agreed, in 1841, to give drawing lessons to the novices at the Hôpital Général, and thus he was authorized to paint his famous portraits Sœur Saint-Alphonse, Sœur Sainte-Anne, and Sœur Saint-Joseph. These remarkable paintings received a laudatory review in Le Canadien, which even termed him “the foremost colourist in the New World.” Offended by the high-flown praise of the article, one reader of Le Fantasque riposted with a hint that the review had been concocted by the artist himself and by one of his warmest admirers, young Joseph-Édouard Cauchon*. 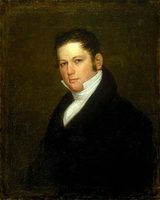 From 1841 Cauchon was, to all intents and purposes, Plamondon’s confidant, promoter, and mentor. He not only purchased many of his paintings, but regularly used his position as a journalist with Le Canadien and later with Le Journal de Québec to win admirers for his friend’s work. For example, in March 1842 he wrote about the portrait in oil of Abbé Charles Chiniquy and in May 1843 about a painting of St Lucia, the first original composition by Plamondon as a history painter. Cauchon also attacked his rivals, such as the French artist Victor Ernette, who had met with marked success since his arrival at Quebec. Cauchon was obviously not the only admirer of Plamondon’s work at the time. On a 24-hour visit to Quebec in August 1843 Joseph-Guillaume Barthe, the editor of the Montreal paper L’Aurore des Canadas, chose to spend his entire afternoon visiting the artist’s studio, which since 1841 had been in “the house of Mr [Roger] Lelièvre (formerly a theatre) opposite the English cathedral and the market.” Barthe was “delighted” by everything he saw in Plamondon’s showroom. After revelling in the collection of European works, he extolled the pictorial qualities of various paintings: Les petits savoyards, a “whimsical piece” inspired by an engraving of a genre-painting; La vigne, a reproduction of a European canvas belonging to Joseph Légaré; Sainte Philomène, Plamondon’s most recent original work; Sainte Catherine de Sienne, a copy of an engraving by Nicolas Bazin after the work by Domenico Feti; and Pape Grégoire XVI, a portrait done in 1842 from a European canvas belonging to the bishop of Montreal, for which Plamondon had already received considerable acclaim. 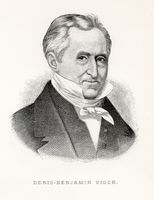 In the period 1840–45 Plamondon missed no opportunity to make his presence known at Quebec by participating in various social and cultural activities. Thus he directed an amateur group specializing in sacred music on the occasion of a solemn mass on 20 May 1840 celebrating the anniversary of the consecration of the archbishop of Quebec. Reporting on this event, a correspondent for Le Canadien stated in no uncertain terms that Plamondon deserved the credit for introducing part-singing into churches in Lower Canada. The following February he was on the general committee formed to establish a Vattemare institute at Quebec [see Nicolas-Marie-Alexandre Vattemare*]. In April 1843 he agreed to take part in the annual show of the mechanics’ institute. In 1845 he gave a three-part lecture on the origins and art of painting to the Société de Discussion de Québec, of which he was a member. The year 1845, however, had not begun auspiciously for Plamondon. On 25 January a few of his canvases were damaged during a fire in the house next door to his studio, and the losses exceeded his insurance coverage. Then misfortune struck again. On 28 June Saint-Jean ward burned down; Plamondon, who lived on Rue Richelieu, lost all his personal belongings, except of course for the contents of the studio he had been occupying since April in the former Château Saint-Louis. In August the newspapers announced that the “ruined” painter was “obliged to part with” his precious collection of paintings by European masters. But these six pictures could not be sold at auction on 12 September as planned; despite the considerable publicity not enough potential buyers came to the sale. Finally, on 3 December his studio nearly caught fire as a result of negligence by certain members of the Oddfellows. The year 1846 was marked by the return from Europe of the highly talented Théophile Hamel, who as a portrait painter soon began to attract a good deal of the business that his former teacher had enjoyed. Anxious to maintain his ascendancy, Plamondon thenceforth tended to emphasize his religious painting. 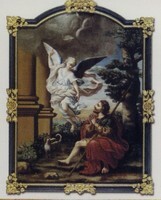 On 15 October Cauchon made a point of noting the admirable use of colour in a picture of St Charles Borromeo painted for the high altar of the church in Industrie (Joliette) “from a poor engraving.” Soon afterwards the artist undertook to paint a canvas commissioned by the art patron and collector Denis-Benjamin Viger* for his censitaires in Île-Bizard. This work, composed and sketched on the advice of Abbé Demers – whom Plamondon found “very difficult” – was finally finished in October 1847. With his creditors at his heels, Plamondon immediately asked for payment, pointing out that the painting had taken him more than five months to finish and had “completely ruined” him. Touched by his appeal, Viger proved generous; not content with paying “very handsomely” for the large religious painting, he also bought Les petits Savoyards. According to Cauchon, Tobie et l’ange Raphaël was Plamondon’s fifth or sixth original composition. No specific mention of further original religious paintings by the artist has been found. It seems likely that after these few successful forays into original composition he thought it more prudent to return to his old habits of copying. In 1849, in response to an article in Le Fantasque the preceding autumn which had ridiculed his inordinate ambition, his bad temper, and his political conservatism, Plamondon took advantage of Aubin’s support for the annexationist movement to publish an attack on republicans and radicals in the Journal de Québec. On 23 Feb. 1850 its readers were treated to a long pompous article in which Plamondon explained the nature of good ecclesiastical paintings and their positive effects, mentioning the fine impression made by one of his own paintings. In his conclusion he could not resist taking a shot at sculptors who worked for churches. These unfortunate remarks prompted an irate reply from one of his former students at the Petit Séminaire, the young ornamental carver Thomas Fournier. In April, when the debate between the two men had barely subsided, Plamondon wrote another article criticizing the mediocre quality of the Stations of the Cross imported from France which had recently been acquired by the church of Saint-Jean-Baptiste at Quebec. 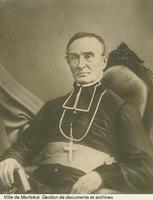 While writing these articles Plamondon continued to turn out many copies of religious paintings, as well as a few portraits that attracted notice, including one of Bishop Modeste Demers* of Vancouver Island and another of Abbé Charles-François Baillargeon*, vicar general in Rome of the ecclesiastical province of Quebec. In August 1850 Légaré and Plamondon successfully tested the quality of various samples of earth suitable for making pigments, which surveyor Georges Duberger had discovered near the mouth of the Saguenay. Two months later Plamondon took part in the Quebec artistic, agricultural, and industrial exhibition, where he showed a genre-painting entitled La chasse aux tourtes. Although it was unfinished, this technically accomplished canvas won universal public acclaim and first prize in the painting category. In the spring of 1851 Plamondon learned that the government was short of space and that he would no longer have the use of his studio in the Château Saint-Louis. Never at a loss, he immediately notified his clients that it would be moved to his property at Pointe-aux-Trembles and thus the price of his paintings would be considerably reduced. In 1842 he had purchased a property in this village, which was about 20 miles upriver from Quebec. Four years later he had built a two-storey wooden house having a well-lit studio at least 18 by 30 feet with a 16-foot ceiling. His property comprised 134 arpents in 1851; 59 were wooded or fallow, another 74 were used to pasture some twenty head of livestock or to grow grain, and the remaining arpent was taken up by a garden and orchard. At that time three young day-labourers worked for Plamondon and were living with him. Anxious to put the management of his farm on a firmer footing, on 25 Oct. 1852 he hired Pierre Plamondon, a local farmer, who may or may not have been a relative. The agreement was signed on the same day as the will by which he made Pierre Plamondon his executor and sole legatee, on the express condition that in the event of his death, his mother, Marie, and his bachelor brother Étienne, who lived with him, would be looked after by Plamondon. Antoine Plamondon evidently soon prospered in farming. In 1861 his land was valued at $4,800 and his implements at $300. He also owned a 230-foot greenhouse, where he had great success in growing grapes. 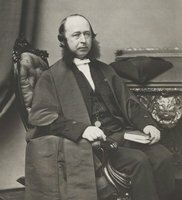 Thus he was cited as an example by Abbé Léon Provancher in his book Le verger canadien . . . , published in 1862. Subsequently he expanded his acreage: the farm included 180 arpents in 1871. Once he had settled permanently in Pointe-aux-Trembles in 1851, Plamondon was held in high esteem by his new fellow parishioners, who were impressed by his moral authority, his conspicuous generosity, and his career as an artist. At the beginning of 1852 he gave them a glimpse of the role he intended to play in his adopted village. He sharply criticized the underhand methods employed by the reform candidate Ulric-Joseph Tessier to win a victory in the constituency of Portneuf in the general elections. Then he joined forces with the parish priest of Pointe-aux-Trembles to condemn the immorality of a brochure written in English and circulating in the parish that advocated the use of contraceptive methods. Once the parish was given municipal status in 1855, Plamondon was chosen by the townsfolk as mayor. Later that year he got the council to adopt a regulation forbidding the sale of intoxicating beverages anywhere in the municipality. Neither his civic responsibilities nor the work entailed in running the farm seem to have been much of an obstacle to his artistic endeavours. During the 1850s at least thirty copies of religious paintings, most of them large canvases, were sent from his vast studio to parishes in various parts of the province. As in the past, his paintings were periodically mentioned in the newspapers, especially in 1857. On 3 April Joseph-Charles Taché wrote an article in Le Courrier du Canada praising the richness of colour in his large painting of the Assumption in the church of Saint-Jean-Baptiste at Quebec, copied from an engraving of a famous work by Nicolas Poussin, a French artist much admired by Plamondon. Taché did, however, express reservations about the addition at the top of the canvas of a choir of six angels, borrowed from Raphael’s St Cecilia. But six months later he had nothing but praise for an enormous painting, 15 feet by 11, that was unveiled in the north chapel of the same church. This work was a copy “after an excellent engraving” of Raphael’s famous Transfiguration in the Vatican, which Plamondon had begun in 1832 and must have put aside until 1855. In December Plamondon was again highly praised for a large canvas he had just installed above the high altar of the church in Le Bic, a picture of St Cecilia after a copy of Raphael’s painting, which had been brought from Europe in 1830. At the beginning of the 1860s Plamondon expressed dissatisfaction at the marked decrease in demand for his work, a direct result of the ever-increasing and varied competition he now had to face. 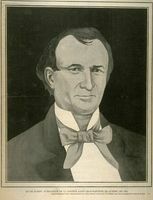 In March 1860 he roundly blamed government authorities for failing to commission even a single painting depicting the “sublime” history of the early Canadian settlers, yet allocating large sums to have about thirty portraits painted of speakers of the Legislative Assembly and the Legislative Council, paintings Plamondon considered devoid of interest. The accusation was in fact a veiled attack on his former pupil Théophile Hamel, who had just completed the contract awarded by the government seven years earlier. On 3 Sept. 1861 Plamondon used the recent acquisition by the Sisters of Charity of Quebec of an impressive canvas of the Sacred Heart about 27 feet high painted by Parisian artist Alexandre Legrand as a pretext for expressing his strong resentment of the importation of European religious paintings. He went so far as to maintain that the Legrand painting was lacking in inspiration, since, “to depict a sacred subject properly, it is absolutely necessary for the painter to have been brought up in the Roman Catholic faith.” In August 1862 Plamondon could not help reacting to the recent success of his compatriot Antoine-Sébastien Falardeau*. Jealous of the reception this famous copyist had received from a number of art lovers during his month-long visit to Canada – the first since his departure for Italy in 1846 – Plamondon wrote a scathing review of his work without deigning to mention his name, which prompted a blistering reply from one of Falardeau’s admirers. Having the assistance of a student probably provided considerable stimulus for Plamondon, whose output increased from 1869. That year, in addition to donating a copy of the Immaculate Conception by Bartolomé Esteban Murillo to the Sisters of the Good Shepherd of Quebec for the high altar of their chapel, he painted two pictures for the church of Saint-Joachim, near Quebec, as well as a Sainte Cécile and a Vierge Sixtine, inspired by Raphael, for the church of Saint-Jean-Baptiste at Quebec. During the unveiling of the two latter canvases Plamondon received a tribute, and an epigram in his honour appeared in Le Courrier du Canada. In the summer of 1870 Plamondon was delighted with a letter published in that paper by French journalist Louis Veuillot, deploring the poor quality of recent works by Italian artists. 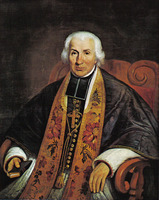 Relying on this opinion to support his argument, he attacked certain “gentlemen in Quebec who for a few years have been going to extraordinary lengths to discourage venerable rural curés from having their church paintings done by Canadian artists, in order to have them painted in Rome by Italians.” In the same breath, he described the portrait of Mgr Elzéar-Alexandre Taschereau, which had just been painted in Rome by Vincenzo Pasqualoni, as mere daubing. In an astonishing burst of creative energy, Plamondon painted over forty religious paintings between 1870 and 1874. Furthermore, in 1871 he exhibited two still lifes of fruit and three years later a canvas inspired by the famous trial of Achille Bazaine, marshal of France. Also in 1874 he wrote a favourable review of a landscape painted by the young Quebec artist Charles Huot*, which, given his usual harsh criticism of the work of his fellow artists, elicited some surprise from certain newspaper columnists. However, Plamondon’s bellicose nature reappeared in November, when he launched a furious attack against a collection of transparencies painted two months earlier by a European artist named Martino for the bicentennial celebrations of the diocese of Quebec. Thus began another controversy, which Plamondon would punctuate with vitriolic and xenophobic criticisms of Martino. Despite his age, Plamondon remained active for at least another ten years. According to a short article published in Le Courrier du Canada on 9 Aug. 1877, he was still working four hours a day at that time. 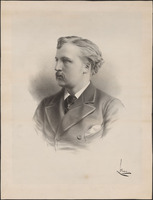 In March 1880 he exhibited 15 oil paintings in a room in the Quebec legislature. That year he was appointed founding vice-president of the Canadian Academy of Arts [see John Douglas Sutherland Campbell*] (which on 19 August became the Royal Canadian Academy of Arts) and submitted as his diploma piece a Nature morte aux pommes et raisins, similar to four other versions he had painted of the same subject between 1869 and 1871. In 1881 Plamondon donated to the nuns of the Hôpital du Sacré-Cœur de Jésus two portraits of members of the clergy painted from photographs. 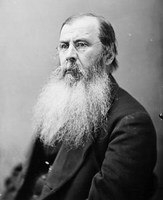 This technique had been a standard one for him since March 1871, when he had taken out an advertisement offering to paint portraits of various sizes from good photographs accompanied by notes on the colour of the complexion, hair, eyes, and, where necessary, beard. Although he was willing to accept orders from “anywhere in the country,” his clientele was restricted largely to his fellow parishioners. 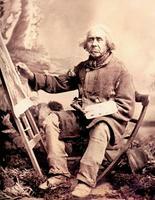 Less and less sure of his creative powers, he even relied on a photograph to paint his self-portrait in 1882. Four years earlier he had been bold enough to venture beyond mere copying to paint one of his few works of imagination, a Rêverie à Venise, which was definitely mediocre. Thus from 1875 until his final retirement Plamondon could not bring himself to abandon his brushes, persisting in painting despite the loss of his abilities, the declining quality of his art, and the almost total absence of a market for his work. Under these circumstances he had no choice but to give away his paintings or sell them cheaply, generosity being the only way he could still earn any recognition. His parish church was not only able to obtain for a reasonable price 18 large religious paintings done in 1881 and 1882, but also received a handsome contribution from him towards the purchase of a Déry organ in 1884. Wishing to finish his days in peace, Plamondon signed in July 1883 a contract of donation inter vivos with a farmer from Pointe-aux-Trembles, Eugène Soulard, to whom he transferred his five pieces of property along with all his possessions except for his paintings, the contents of his studio, his musical instruments, and his music books. In return, Soulard agreed to take care of his benefactor and Plamondon’s brother Étienne for the rest of their days. The last known works by the old artist – two portraits of prominent citizens of Pointe-aux-Trembles – date from 1885. In February of that year Plamondon, then over eighty, ran an advertisement in Le Courrier du Canada announcing that owing to his great age he had to “lay down [his] pencil and brush” and to sell the contents of his studio which consisted of some thirty salon paintings, four large portfolios of drawings and engravings of works by the old masters, as well as numerous volumes on art. A man of extraordinary stamina, he lived for another ten years before dying in 1895 at the age of 91. As a mark of the great respect he had always enjoyed since settling in Pointe-aux-Trembles in 1851, he was buried in the crypt of the parish church. Antoine Plamondon was distinguished by his unusual manners and his odd personality. Though his head was rather large for his slender frame, his features were strikingly expressive. He ate sparingly and was unfailingly punctual; mealtimes never varied and his work habits were set in stone. His stern disposition made him intolerant of levity. He was frugal by nature and could not abide luxury or women. In matters of morality, religion, and politics he was ultra-conservative, and he had a morbid fear of change and of new ideologies. In spite of his perfunctory schooling, he was regarded as an educated man. Although he often managed to impress his interlocutors by knowledge gleaned from books and sometimes imperfectly assimilated, in fact his general knowledge was quite superficial, as is evident in the various newspaper articles and letters he wrote. Apart from their pretentious tone, they contain many truisms, frequent contradictions, and singular lapses of vocabulary and style. Despite claims to the contrary, Plamondon accorded much more importance to paintings of religious inspiration than to his portraits; they accounted for more than half of his total output. As a history painter, he claimed to draw his inspiration from the classical tradition of Raphael, Poussin, Louis David, and Paulin-Guérin. Shaped by his academic training and a little reading, his conception of painting was inspired by the purest conservatism. He believed that good church art instructed and edified the faithful, while providing fitting decoration for the house of the Lord. Plamondon’s copies of religious works shows his marked predilection for certain great French and Italian artists of the 16th and 17th centuries. It is no less true that his straight copies of and his variations on European paintings and engravings helped broaden the visual world of Canadians and acquaint them with the great art of past centuries. In his view, a copy was inseparably linked with the original from which it was taken, and usually this original was the object of unbounded admiration. Each time he produced a good copy, Plamondon felt he had attained an ideal, and his contemporaries spontaneously associated his artistry with that of the original. He could of course display some originality in his interpretation, particularly with respect to colour, when copying from a monochrome engraving. On other occasions he expressed his own creativity by using only part of the picture being copied, or by combining elements borrowed from various iconographic sources into a new composition. AC, Québec, Minutiers, L.-P. Bernard, 5 juill. 1883. ACAM, 450.904, 830-1, 830-5. ANQ-Q, CN1-100, 29–30 juill. 1842; 16 févr., 10 avril 1843; 25 oct. 1852; CN1-157, 11 juill. 1842; CN1-212, 1er mars 1819; 28 mars, 5 juill. 1834; CN1-219, 16 déc. 1845; 13 janv., 31 mars 1846; Livernois, J.-E., photographie d’Antoine Plamondon; P-417, Corr. entre John Burroughs et Amédée Papineau, août 1891. AP, Notre-Dame de l’Annonciation (L’Ancienne-Lorette), Reg. des baptêmes, mariages et sépultures, 2 mars 1804; Notre-Dame de Montréal, Corr., Antoine Plamondon à [J.-V.] Quiblier, 18 juin, 16 déc. 1839; 1er mai 1841; Livre des délibérations des marguilliers, 14 juin 1847; Saint-François-de-Sales (Neuville), Corr., Siméon Alary à Charles Darveau, 11 sept. 1917; Corr. à Hormisdas Magnan, 15 nov. 1922 (copie); “Notice biographique sur Antoine Plamondon par un contemporain”; Reg. des baptêmes, mariages et sépultures, 7 sept. 1895. Arch. de l’Hôpital Général de Québec, Journal du noviciat, 1 (1837–57), 19 juill. 1841. Arch. de l’Hôtel-Dieu-du-Sacré-Cœur (Québec), Annales, 8 févr., 15 mai, 16 juill., 26 sept. 1881; 30 oct. 1882. Arch. du monastère de l’Hôtel-Dieu de Québec, Inv. après décès et évaluation des tableaux et gravures de l’abbé L.-J. Desjardins, tiroir 2, carton 99, no.17; Notes et mémoires des anciennes mères, armoire 5, no.11: 8, 1838; Recettes et dépenses [monastère], 1825–57: 233. Arch. du monastère des ursulines (Québec), Fonds L.-J. Desjardins, corr., 22 oct., 25 déc. 1827; 10 mai, 25 août, 23 oct. 1830; 14 mars 1831; 6 juill. 1833; 17 nov. 1836; 12 avril, 26 oct. 1838; Pâques 1841; hiver 1841–42; mai 1842. AVQ, Finances, bureau des cotiseurs, rôles d’évaluation et d’imposition, 1845. Bibliothèque du Musée du Québec (Québec), Dossier Antoine Plamondon, corr., Plamondon à D.-B. Viger, 10 juin 1843. McCord Museum, Antoine Plamondon file, corr., Plamondon to D.-B. Viger, 28 Oct. 1847. NA, RG 31, C1, 1851, 1861, 1871, Pointe-aux-Trembles (Neuville, Que.). 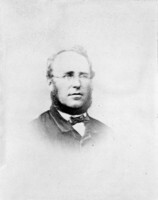 National Gallery of Canada (Ottawa), Photograph of Antoine Plamondon, c. 1860. Private arch., D. G. Anderson (Montreal), Corr., Antoine Plamondon to D.-B. Viger, 27 Nov. 1846. Qué., Ministère des Affaires culturelles, Centre de documentation, Fonds Morisset, 2, dossier Antoine Plamondon. F.-X. Garneau, Voyage en Angleterre et en France dans les années 1831, 1832 et 1833 (Québec, 1855; réimpr. 1881), 107–8. Journal de l’Instruction publique (Québec et Montréal), 1 (1857)–2 (1858); 5 (1861)–6 (1862); 9 (1865); 14 (1870)–17 (1871). Journal of Education for Lower Canada (Montreal), 1 (1857): 50, 111–12. “Sciences et arts,” La Bibliothèque canadienne (Montréal), 3 (1826–27): 36. L’Abeille (Québec), 29 mai, 28 juin 1850; 25 oct. 1860; 28 nov. 1878; 11 mars 1880. L’Ami de la religion et de la patrie (Québec), 10 nov., 13 déc. 1848; 27 févr. 1850. L’Ami du peuple de l’ordre et des lois (Montréal), 5 mai 1838. L’Aurore des Canadas (Montréal), 6 déc. 1839; 24 nov., 22, 24 déc. 1842; 24 août 1843; 3 avril, 28 août, 11 oct. 1845; 14 août, 1er déc. 1846; 2 févr., 23 nov., 3 déc. 1847. Le Canadien, 17 oct. 1832; 24 juill., 7 août, 27 sept., 27 nov. 1833; 21 avril 1834; 19 juin, 2 sept. 1835; 10, 17 juin, 1er juill., 10 oct. 1836; 27 oct. 1837; 30 avril, 9 mai, 16 juill., 26, 28 sept., 1er oct. 1838; 27 nov., 4, 6, 11 déc. 1839; 15 janv., 24 juin, 12 août, 23 oct., 30 déc. 1840; 26 févr., 12 mars, 2 juin, 20 août 1841; 23, 30 mars 1842; 2 janv., 8 mars, 24 avril, 24 mai, 11 oct. 1843; 27 janv., 21 févr., 21 avril, 18 août, 10, 15 sept., 6 oct. 1845; 25 févr. 1846; 12 févr., 11, 15 oct., 19 nov. 1847; 13 oct. 1848; 27 juin 1849; 27 mai, 19 août, 18 oct., 18 nov. 1850; 2 juin 1851; 14 janv., 25 févr., 14 avril 1852; 11 juin 1855; 13 août 1862; 1er sept. 1865. Le Castor (Québec), 17 avril 1845. Le Courrier du Canada, 3 avril, 2 oct., 11 déc. 1857; 21 mars 1860; 6 sept. 1861; 22 août, 8 sept. 1862; 10 nov., 15 déc. 1869; 3 janv., 1er juill 1870; 17 mars 1871; 16 sept. 1874; 9 août, 21 sept. 1877; 11 mars 1880; 8 janv. 1881; 18 févr., 22 juin 1885; 2 déc. 1886. L’Électeur, 29 mars 1881, 12 janv. 1883, 12 déc. 1884, 20 févr. 1894, 16 sept. 1895. L’Encyclopédie canadienne (Montréal), octobre, décembre 1842. L’Événement, 13 sept. 1871, 25 mai 1875, 29 janv. 1898. Le Fantasque (Québec), 21, 28 juill. 1838; 19 juin, 23 août 1841; 7 avril 1842; 22 avril 1843; 14 oct. 1848. Le Journal de Québec, 24 déc. 1842; 3 janv., 7 mars, 16, 20 mai, 1er juin, 12, 27 sept., 3, 7, 19 oct. 1843; 21 mars, 2, 25 mai, 3 août, 12, 26 sept. 1844; 7, 16, 28 janv., 6, 20 févr., 17 avril, 19, 23 août, 16 sept., 4 déc. 1845; 4, 11 août, 15 oct., 18 nov. 1846; 28 janv., 22 juin, 1er juill., 12, 14 oct., 16 nov., 9 déc. 1847; 20 avril 1848; 23 juin, 3 nov. 1849; 7, 23 févr., 7, 12, 26 mars, 4, 11, 13 avril, 25 mai, 6, 10, 20 août, 8, 12 oct., 19 nov. 1850; 29 mars, 1er mai, 3, 5 juin 1851; 7, 18 juin, 6 oct. 1853; 9 juin, 4, 22 déc. 1855; 3 sept. 1861; 2 août 1862; 18 oct. 1864; 4 oct. 1865;19 janv. 1866; 19 mars, 18 nov. 1869; 23 mars, 16 mai 1871; 21, 26 nov., 16 déc. 1874; 11 avril 1883; 1er avril, 18 sept., 26 déc. 1884; 2 déc. 1886; 8 sept. 1887. Mélanges religieux (Montréal), 1841: 141; 1842: 316; 30 mai, 3 oct. 1843; 14 août 1846; 19, 26 nov. 1847. La Minerve, 8 nov. 1830; 10 juin, 26 août 1833; 27 juin, 29 sept. 1836; 22 déc. 1842; 14 août 1845; 14, 18 oct. 1847; 13 nov. 1848; 28 févr., 14 oct. 1850; 25 août 1857; 18 juin 1869; 6 juin 1874; 13 mars 1880; 17 sept. 1895. Le Monde illustré, 14 janv., 14 juill. 1888; 19 oct. 1895. Montreal Gazette, 31 Dec. 1833, 24 May 1834. Le Populaire (Montréal), 14 mai, 17 août 1838. La Presse, 16 sept. 1895. Quebec Gazette, 31 March 1825, 12 June 1826, 8 Nov. 1830, 12 Oct. 1832, 13 Dec. 1833, 5 Dec. 1845. Quebec Mercury, 27 July, 19 Dec. 1833; 24 July 1838; 26 Nov., 5 Dec. 1839; 28 March 1840; 10 Jan. 1843; 6 May 1845; 9 June 1853. La Ruche littéraire et politique (Montréal), 1853. M.-N. Boisclair, Catalogue des œuvres peintes conservées au monastère des Augustines de l’Hôtel-Dieu de Québec ([Québec]), 1977). Canada, an encyclopædia (Hopkins), 4: 355–56. Canadian encyclopedia, 3: 1423. Dictionnaire critique et documentaire des peintres, sculpteurs, dessinateurs et graveurs de tous les temps et de tous les pays (nouv. éd., 10v., Paris, 1976), 8: 373. Harper, Early painters and engravers, 252–53. Yves Laframboise et al. ; Neuville, architecture traditionnelle ([Québec], 1976), 211–17. Le Jeune, Dictionnaire, 2: 447. G.-A. Roy et Andrée Ruel, Le patrimoine religieux de l’île d’Orléans (Québec, 1982), 14, 136, 189–91. Royal Canadian Academy of Arts; exhibitions and members, 1880–1979, comp. E. de R. McMann (Toronto, 1981), 331. À la découverte du patrimoine avec Gérard Morisset . . . , sous la direction de Claude Galarneau (Québec, 1981). Georges Bellerive, Artistes-peintres canadiens-français: les anciens (2 sér., Québec, 1925–26), 1: 25–37. J. S. Boggs, The National Gallery of Canada (Toronto, 1971), 108–9. P.-V. Charland, La grande artiste ou le zèle artistique de l’Église . . . (Québec, 1923), 386. H.-J.-J.-B. Chouinard, Fête nationale des Canadiens français célébrée à Québec en 1880: histoire discours rapport . . . (4v., Québec, 1881–1903), 1: 492–93. W. [G.] Colgate, Canadian art: its origin & development (Toronto, 1943; repr. 1967), 108–11. L’église de L’Islet, 1768–1968, sous la direction de Léon Bélanger (s.l.n.d. ), 53–59, 61, 68. Émile Falardeau, Un maître de la peinture: Antoine-Sébastien Falardeau (Montréal, 1936), 113–20. Kenneth Garlick, Great art and artists of the world; British and North American art to 1900 (New York, 1965), 60, 158. Patricia Godsell, Enjoying Canadian painting (Don Mills [Toronto], 1976), 48–49. J. R. Harper, Painting in Canada, a history ([Toronto], 1966). R. H. Hubbard, The development of Canadian art (Ottawa, 1963); “Growth in Canadian art,” The culture of contemporary Canada, ed. Julian Park (Ithaca, N.Y., 1957), 117. Yves Lacasse, Antoine Plamondon (1804–1895);the way of the cross of the church of Notre-Dame de Montréal (Montreal, 1984). Laurier Lacroix, “Essai de définition des rapports entre la peinture française et la peinture canadienne au XIXe siècle,” Les relations entre la France et le Canada au XIXe siècle; colloque (Paris, 1974), 39. J. M. LeMoine, L’album du touriste . . . (2e éd., Québec, 1872), 19–20, 22. Barry Lord, The history of painting in Canada: toward a people’s art (Toronto, 1974), 35–38. N. McF. MacTavish, The fine arts in Canada (Toronto, 1925; repr. [with intro. by Robert McMichael], 1973), 176. Hormisdas Magnan, La paroisse de Saint-Nicolas: la famille Pâquet et les familles alliées (Québec, 1918), 11. [J.-L.-]O. Maurault, Marges d’histoire; l’art au Canada (3v., Montréal, 1929–30), 1: 298; La paroisse: histoire de l’église Notre-Dame de Montréal (Montréal et New York, 1929), 163–66. Peter Mellen, Landmarks of Canadian art (Toronto, 1978). Gérard Morisset, “Les arts au temps de Garneau (essai),” Centenaire de l’“Histoire du Canada” de François-Xavier Garneau . . . (Montréal, 1945), 417; Le Cap-Santé, ses églises et son trésor, C. Beauregard et al., édit. (2e éd., Montréal, 1980), 38, 47–53, 135–43; Coup d’œil sur les arts en Nouvelle-France (Québec, 1941; réimpr. 1942), 52, 62–64, 70, 72–73, 81, 145; Peintres et tableaux (2v., Québec, 1936–37), 1: 12–15, 44–45, 141–57; 2: 76–77, 99–109, 117–54; La peinture traditionnelle au Canada français (Ottawa, 1960), 103–11. Edmund Morris, Art in Canada: the early painters ([Toronto, 1911]). J. R. Porter, Antoine Plamondon: Sister Saint-Alphonse (Ottawa, 1975); “Un peintre collectionneur québécois engagé dans son milieu: Joseph Légaré (1795–1855)” (thèse de phd, univ. de Montréal, 1981), 36–37, 39, 43, 118, 228, 230, 233–34, 253, 263–65, 379, 384. J. R. Porter et Jean Bélisle, La sculpture ancienne au Québec; trois siècles d’art religieux et profane (Montréal, 1986). J. R. Porter et Jean Trudel, Le Calvaire d’Oka (Ottawa, 1974), 91–92. D. [R.] Reid, A concise history of Canadian painting (Toronto, 1973), 48–52. Guy Robert, La peinture au Québec depuis ses origines (Sainte-Adèle, Qué., 1978), 26–27. Saint-Jean-Baptiste de Québec; album publié à l’occasion du 50e anniversaire de l’érection canonique de la paroisse et du jubilé d’or de Mgr J.-E. Laberge, curé (Québec, 1936), 57–59, 136–38. A. E. Samuel et al., Treasures of Canada (Toronto, 1980), 185. F. [K. B. S.] Toker, The Church of Notre-Dame in Montreal; an architectural history (Montreal and London, Ont., 1970), 91–92. Raymond Vézina, Théophile Hamel: peintre national (1817–1870) (2v., Montréal, 1975–76), 1. John Alford, “The development of painting in Canada,” Canadian Art (Ottawa), 2 (1945): 95. P.-V. Charland, “Les ruines de Notre-Dame; l’ancien intérieur,” Le Terroir (Québec), 5 (1924–25): 157. Paul Dumas, “History of painting,” Canadian Collector, 9 (1974), no.3: 38, 41, 43. Charles East, “Saint-Augustin de Portneuf,” L’Action catholique (Québec), 8 sept. 1934: 5. J. R. Harper, “Three centuries of Canadian painting,” Canadian Art, 19 (1962): 415; “Tour d’horizon de l’art canadien,” Vie des arts (Montréal), no.26 (printemps 1962): 33–34. R. H. Hubbard, “Ninety-year perspective,” Vie des arts no.58 (printemps 1970): 25; “Primitive with character: a Quebec school of the early nineteenth century,” Art Quarterly (Detroit), 20 (1957): 21–29. M.-D. Labelle et Sylvie Thivierge, “Un peintre huron du XIXe siècle: Zacharie Vincent,” Recherches amérindiennes au Québec (Montréal), 11 (1981): 326. Yves Lacasse, “La contribution du peintre américain James Bowman (1793–1842) au premier décor intérieur de l’église Notre-Dame de Montréal,” Journal of Canadian Art Hist. (Montreal), 7 (1983–84), no.1: 74–90. Laurier Lacroix, “La collection Maurice et Andrée Corbeil,” Vie des arts no.72 (automne 1973): 26, 28. Napoléon Legendre, “L’art et les artistes au Canada,” Rev. de Montréal, 2 (1878): 656. Hormisdas Magnan, “Peintres et sculpteurs du terroir” and “Perte nationale; liste des tableaux incendiés avec la basilique de Québec le 22 décembre 1922,” Le Terroir, 3 (1922–23): 350–51 and 376–77. Gérard Morisset, “À l’église du Cap-Santé,” Le Canada (Montréal), 23 juin 1936: 2; 24 juin 1936: 2; “Antoine Plamondon (1804–1895),” Vie des arts, no.3 (mai–juin 1956): 7–13; “À propos d’une illusion de perspective,” L’Action catholique, 28 avril 1945: 4; “La chasse aux tourtes,” Almanach de l’Action sociale catholique, (Québec), 20 (1936): 46–48; “Deux chefs-d’œuvre de Plamondon,” La Renaissance (Montréal), 24 août 1935: 5; 31 août 1935: 5; “Un grand portraitiste: Antoine Plamondon,” Concorde (Québec), 11 (1960), no.5–6: 14–15; “L’influence française sur le goût au Canada,” Le Monde français (Montréal et Paris), 5 (1947): 236–37; “Les miracles de Sainte-Anne,” Le Droit (Ottawa), 9 juill. 1936: 2; 20 juill. 1936: 3; “Les peintures de Plamondon à l’Hôtel-Dieu de Québec” and “Un peintre monarchiste,” Le Canada, 28 mai 1935: 2, and 30 mars 1936: 2; “Plamondon à Neuville,” Almanach de l’Action sociale catholique, 19 (1935): 53–55; “Les prouesses picturales de Antoine Plamondon,” L’Événement, 15 janv. 1935: 4; 16 janv. 1935: 4; 17 janv. 1935: 4; “Quelques toiles de Plamondon chez les dames ursulines de Québec,” La Renaissance, 29 juin 1935: 5. “Le Musée de Montréal,” Rev. de Montréal, 4 (1880): 492–93. J.-T. Nadeau, “La Pointe-aux-Trembles,” Almanach de l’Action sociale catholique, 5 (1921): 71. J. R. Porter, “La société québécoise et l’encouragement aux artistes de 1825 à 1950” and “Antoine Plamondon (1804–1895) et le tableau religieux: perception et valorisation de la copie et de la composition,” Journal of Canadian Art Hist., 4 (1977), no.1: 14, 17–18, 22–23, and 8 (1984–85), no.1: 1–25; “Un projet de musée national à Québec à l’époque du peintre Joseph Légaré (1833–1853),” RHAF, 31 (1977–78): 78. Pierre Rosenberg, “The artists who influenced Plamondon,” M (Montreal), 2 (1970–71), no.4: 10–13. “Sensationnelle découverte, dans une cave de Montréal, de dix-sept tableaux du peintre canadien Antoine Plamondon (1802–1895),” Photo journal (Montréal), 16 oct. 1947. The following exhibition catalogues are also informative: L’Art au Canada, Gilberte Martin-Méry, compil. (Bordeaux, France, 1962), 19–20; The arts in French Canada, comp. Gérard Morisset (Vancouver Art Gallery, Vancouver, 1959), 49; The painter and the New World, comp. D. G. Carter (Montreal Museum of Fine Arts, Montreal, 1967); and Painting in Canada; a selective historical survey (Albany Institute of Hist. and Art, Albany, N.Y., 1946), 25–26; as are numerous catalogues issued by the Musée du Québec: The arts in French Canada, comp. Gérard Morisset (1952); Le diocèse de Québec, 1674–1974, Claude Thibault, compil. (1974), 17, 31, 43, 58; Le grand héritage; l’Église catholique et les arts au Québec, J. R. Porter et al., compil. (1984), 35–52, 120–23, 312; Landscape painting in Quebec (1800–1940), comp. Claude Thibault (1978), 15, 60–61; Le Musée du Québec: 500 œuvres choisies (1983); Peinture traditionnelle du Québec, Jean Trudel, compil. (1967), 8, 82–91; and Trésors des communautés religieuses de la ville de Québec, Claude Thibault, compil. (1937). Relevant catalogues issued by the National Gallery of Canada include: Three hundred years of Canadian art, comp. R. H. Hubbard and J.-R. Ostiguy (1967), 24, 52–53, 58–59, 70–71, 90–91, 247; Two painters of Quebec: Antoine Plamondon/1802–1895, Théophile Hamel/1817–1870, comp. R. H. Hubbard (1970); and The works of Joseph Légaré, 1795–1855: catalogue raisonné, comp. 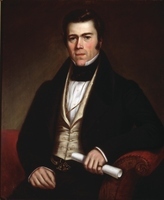 J. R. Porter (1978), 10, 15–16, 119, 133; as well as two publications issued jointly with the Musée du Québec: Canadian portraits of the 18th and 19th centuries, comp. Gérard Morisset and Claude Picher (Ottawa, 1959) and Treasures from Quebec, comp. J. R. Harper (Ottawa and Quebec, 1965), 41–42, 51, 62; and Painters of Quebec: Maurice and Andrée Corbeil collection, comp. R. H. Hubbard, published jointly with the Montreal Museum of Fine Arts (Ottawa, 1973), 72–87. John R. Porter, “PLAMONDON, ANTOINE,” in Dictionary of Canadian Biography, vol. 12, University of Toronto/Université Laval, 2003–, accessed April 24, 2019, http://www.biographi.ca/en/bio/plamondon_antoine_12E.html.